Under the Oak Tree: One off the list! This is one of those post that I hope the Boss doesn't read. 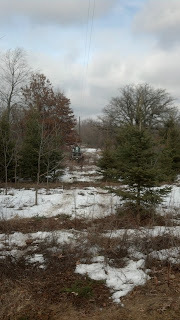 For the last two years Joe has asked me to clean out some trees underneath the power line that supplies the farm house. He's tended to say things like "when you get sometime" or " if you have some free time." Well, I didn't have extra time this week, I simply made it a priority to check this one off the list. If you look closely, the power line is visible in the photo. The trees growing below it are White Spruce, Black Walnut, Red Oak, Black Cherry, and Shagbark Hickory. 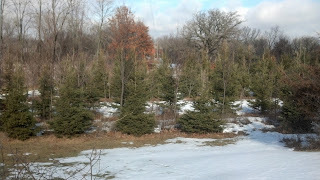 The ten rows of these trees had been planted around ten years ago. Unfortunately, in another couple of years they will be touching the power line. I used the tree shear to remove trees and stack them on a brush pile. Have I shared with you all how much I appreciate that implement? I didn't treat the stumps in figuring that the sprouts will give the deer something to nibble on this spring and summer. And for once that something will be a tree we don't care about. You might notice in the after photo that I didn't clear a wide area underneath the power line. My thoughts are, in another three or for years I can start procrastinating all over again.